It is quite apparent that free agency has been in a freeze the past two off-seasons. It is most notable this year, with a pair of 26-year-old generational talents out on the open market and not getting anywhere near what their stats dictate they should get. MLB revenues have been climbing for the past 16 years, and in 2018 it was at $10.3 billion according to Forbes. Yet the amount spent on players has not proportionately followed. Clearly, the current Collective Bargaining Agreement (CBA) needs reform. The CBA runs through 2021, and thus it looks like players may face more tough times in the near future. There is still some time before some Yankees becoming eligible for free agency. Gary Sanchez, Aaron Judge, and Luis Severino will hit the open market after the 2022 season. Miguel Andujar and Gleyber Torres will the following year. Ignoring the potential for a more player-friendly CBA before many current Yankees becoming free agents, the question becomes whether they should be more willing to negotiate an extension rather than testing the (freezing) waters. 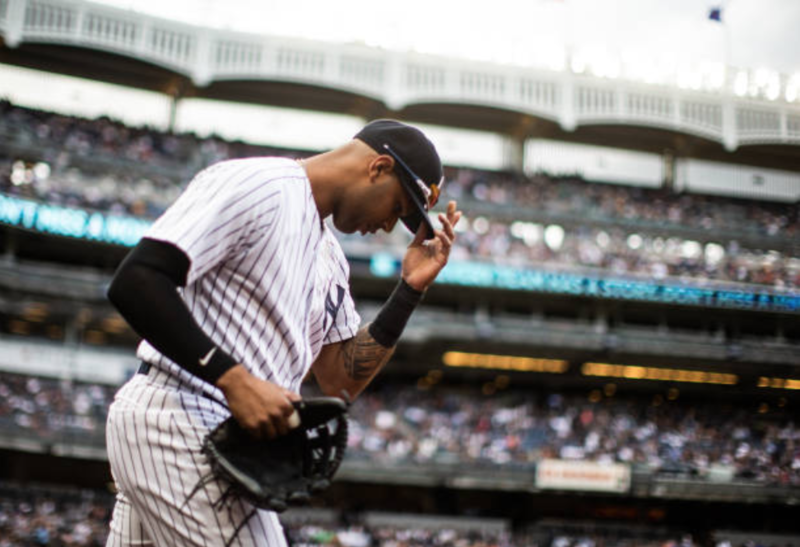 Would the Yankees get a better deal if they extend Aaron Hicks now rather than retaining him via free agency (assuming they want him back)? 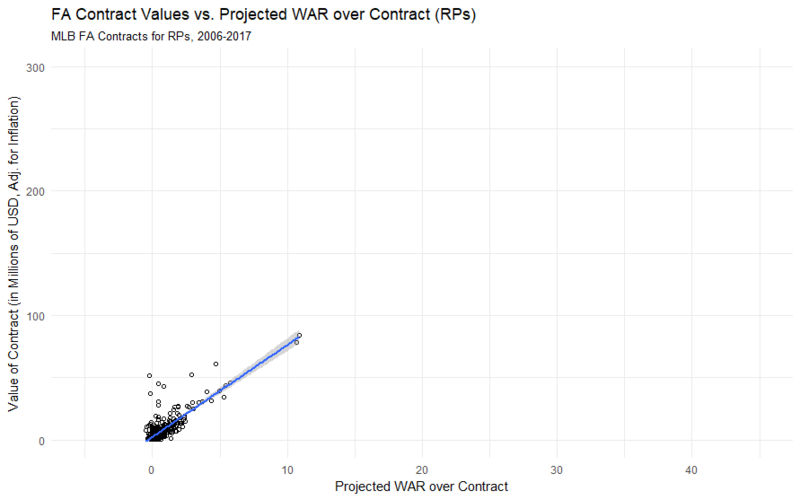 Back in 2017, Matt Swartz of Fangraphs forecasted the dollars per WAR for the following five seasons. Their 2019 figure was $11.7 million. Hicks put up a 4.9 WAR last year. This estimate would put his annual value at $55.37 million. This, of course, is absurd, but these numbers are tied to the net average annual value (AAV) of contracts in prior free agent classes. Even given natural inflation of salaries and the ever-increasing revenue being raked in by the league, $55.37 million still seems high. But perhaps the real figures being floated out there today to current free agents are too low. The right answer is somewhere in the middle. A relatively more modest estimate of dollars per WAR is $8 million. This still would put Hicks at a $24 million AAV if he averaged a 3.0 WAR (he put up a 3.3 WAR in 2017). 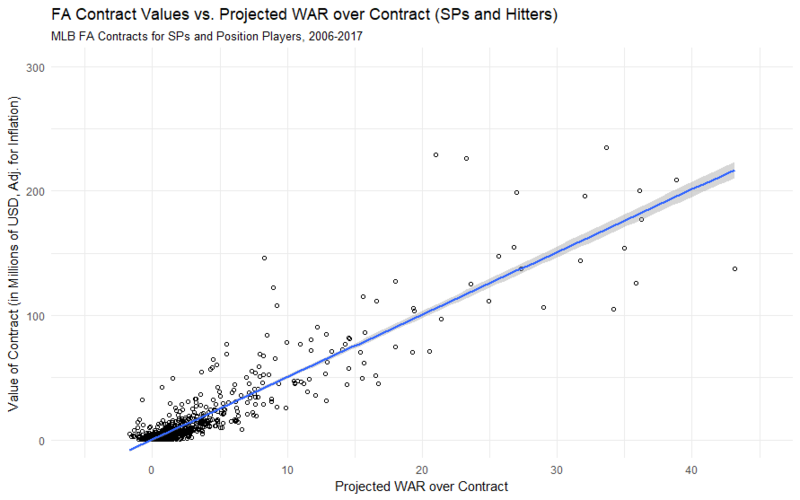 Fangraphs’ Johns Edwards more recently estimated a player’s value based on WAR. Staying with Hicks – say, for example, that he was to receive a five-year offer and average a 3.5 WAR per season. That would be a total WAR of 17.5. By the chart below, that would put him in the neighborhood of an $80 million deal. A.J. Pollock was reportedly looking for that this offseason, but he had to settle for a guaranteed $50 million over four years. Could Hicks beat that and get closer to his realized value? Maybe. But given the current climate, it may not be very likely as he will be going into his age-30 season in 2020. Therefore, if the Yankees offered him a four year, $60 million extension, would Hicks bite knowing that it would give him security should anything happen during the 2019 season? If he did, it would be a steal for the Yankees given his projected value on the open market. Betances’ situation as a reliever is a little different. Since his breakout season in 2014, he has averaged a 2.32 WAR. 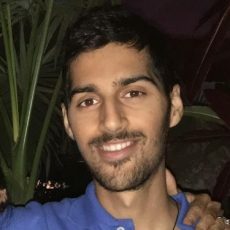 Relievers tend to age better than position players, so let’s say he lands a 4-year contract and maintains that production – a total WAR of about 9.3. By the chart below for relievers, this would put his value at roughly $71.5 million. The largest total value obtained by a reliever in the last two offseasons has been Wade Davis at $52 million with the Rockies. The maximum for a non-closer reliever is Zach Britton with the Yankees at $39 million (he will not be primarily used as a closer). Is there any shot Betances gets over $70 million? Very unlikely. The obvious issue is that owners do not want to spend the amount that the players’ perceive their value to be. Being the first Yankees up and having witnessed the sluggish pace of the market the last two years, Hicks, Betances, and Gregorius have a choice to make: take the security and sign an extension (should the team offer them extensions) or try for a big contract that may never come. The choice is especially interesting for Gregorius, as he will likely not return until late in the season and have to prove he can return to his former self. All in all, if the Yankees want to hang on to some of their players they have a chance to be proactive and lock them up for a potential bargain in relation to what the numbers say they are worth. Or are they be willing to let them test free agency and see where the price settles?